The modern city of Hiroshima, dotted with breathtaking and moving historical elements is one of the most popular sightseeing destinations in all of Japan. After a few rounds on the course, there are many compelling and popular attractions to visit and delectable cuisine to try that will excite both epicureans and dining novices alike. Hiroshima is located on the western side of Honshu, Japan’s largest island and is 4 hours away from Tokyo by bullet train. There are many iconic pictures of Japan with beautiful stretches of water as far as the eye can see with one notable structure in the distance, a bright red wooden archway. Although it may look like a fairy tale come to life, this is Miyajima, also known as “Shrine Island”. This ancient site is a must-see on your travels in Hiroshima. There’s nothing more relaxing after a hard day of hitting the green than visiting the tranquil setting of Shukkeien. The name literally translates to “Shrunken Garden” which is an accurate depiction of the landscape; many natural formations such as mountains and forests are represented here on a much smaller scale to give the illusion of all the wonders of nature culminating in one place. Take a walk along the paths and enjoy the view. One of the most notable landmarks on the island, Hiroshima Memorial Peace Park is a symbol of remembrance and humility. Many visitors come to pay their respects and visit the Peace Memorial Museum to learn about the history of this tragic event and its effect on the entire world. During this special time of year the Hiroshima Branch of Japan Mint opens its property to the public so visitors can witness the thousands of cherry blossoms bloom. It is traditional custom to have a picnic under the trees and bask in the glory of nature’s wonders. 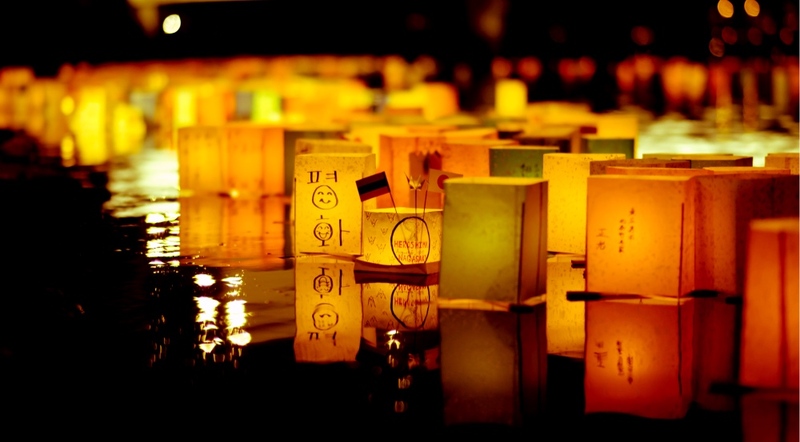 Translating roughly to “Floating Lantern Ceremony” this captivating event is held to pray for peace across the world. 10,000 glowing lanterns are released into the rivers of Hiroshima in a display that appears like stars are playing on the water. Japan is well known for their spectacular Christmas light displays, but Hiroshima Dreamation is a unique standout amongst the rest. With the entirety of downtown illuminated in a winter wonderland, it’s a breathtaking site for visitors of all ages. Oysters Did you know up to 70% of Japan’s oysters come from Hiroshima? Enjoy the fresh taste right from the source in a variety of ways including raw, deep-fried, with ponzu, a traditional Japanese citrus sauce or grilled on top of rice. Momijimanju - If you have a sweet tooth this delectable dessert will be sure to excite your taste buds. Originally created in Miyajima, this treat is shaped like a maple leaf and has a thick dough exterior with a variety of fillings from cheese to chocolate. Find your favorite and enjoy them on a walk around the island! Tsukemen- A take on the internationally known “ramen”, tsukemen are cold noodles that you dip into a warm thick bowl of soup. The base of the soup varies, but Hiroshima’s style adds a kick of spice. Dining guests can gauge how spicy they want it before diving into this delicious bowl of warmth and satisfaction. Giving and receiving omiyage or souvenirs, is a common Japanese custom. When you visit Hiroshima, there are many popular items to bring back. A box of momijimaju as previously mentioned is a great treat. If you’re looking for a non-food item, traditional wooden toys are a popular choice and a one-of-a-kind item you can’t find anywhere else. There are a variety of upscale amenities in Hiroshima, one of the most notable being Sekitei (http://www.sekitei.co.jp/en/) a gorgeous Japanese-style inn complete with serene hot springs and beautiful garden on the hillside. Enjoy local cuisine and relax on traditional Japanese tatami mats for an authentic experience. Another great selection is the Righa Royal Hotel Hiroshima, a modern contrast to the previous choice; this hotel has all the upscale amenities of a five-star luxury resort. A breathtaking Atrium welcomes you as you are whisked away by the highest quality omotenashi service Japan can offer. Hiroshima is both a notable landmark and breathtaking backdrop for golfers to enjoy the historical elegance of the landscape with the modern amenities of city life. The island is beautiful all throughout the year and provides visitors with a variety of unforgettable experiences across a multitude of potential discoveries. We hope you enjoy your visit! From Tokyo: There are a variety of options from Tokyo including 90-minute flights from Haneda Airport, 4-hour bullet train excursions from Tokyo Station or you can even take a scenic journey on local rail lines. If you opt for the longer route, it’s a good idea to purchase a Seishun-18 rail pass, which gives you 5 days of unlimited access to all local trains. From Osaka: Visitors can take a bullet train from Shin-Osaka station and arrive in Hiroshima in only an hour and a half. You can also take an overnight bus from the Osaka JR Express Bus Terminal, which takes about seven hours.